Mike Candrea, University of Arizona women’s softball Coach, has built the U of A’s program into a perennial contender. He has led Arizona softball to five NCAA titles since 1991. Candrea is sought out by softball and baseball coaches in the United States and has held instructional clinics nationally to help improve the way the sport is taught and played. Candrea has written several books and produced a number of videotapes on various softball subjects and has designated specific practice aids and equipment that are widely used at various levels of play. His team’s style of play, public comportment and the consistent winning puts Wildcat fans in the stands. (In 1997, for example, the Wildcats drew 22,294 fans, and set an attendance record with an average of 1,592 per date.) Arizona is among national leaders in home attendance. 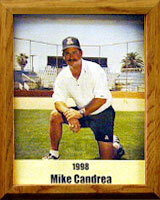 Mike was inducted into the National Fast-pitch Coaches Association Hall of Fame in 1996. During his time at Arizona he has earned 12 conference, regional and national Coach of the Year awards.